Munn provides more choice and savings for all your insurance needs. We say switching is easy... and it's true! In the past year, people have left these companies to come to Munn. People are switching to Munn for many reasons. Fast claims processing, competitive rates, and responsive, respectful customer care. We have earned a reputation of always having your best interests at heart. That’s why we deliver truly exceptional service. The kind that makes you smile! We will guide you through the claims process, helping to ensure a swift and fair settlement by the insurance company. Getting you right back to where you were. Munn Insurance will shop the insurance markets to provide you with multiple quotes on your home or auto insurance and up to 20 on business insurance. As an independent insurance broker, we work for you. We act as your personal advisor; providing unbiased advice on your individual insurance needs. Not all insurance polices are created equal. As your broker, we work for you. And we make sure that you have the best coverage available. We answer to you. 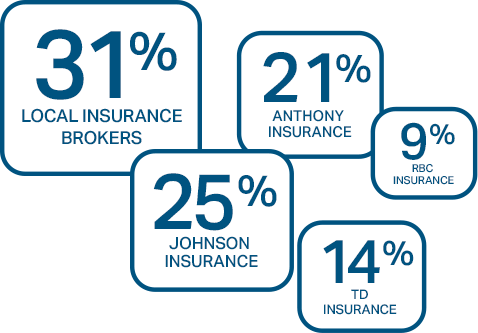 We have access to many insurance markets. Most places only have one! So we shop around on your behalf and find you the best insurance at the best price. A quote with real savings is just the beginning. You get our promise to provide the best protection and customer care for all that’s important to you.